The guitar Hendrix played before he was famous goes up for auction next month. Does anyone have a spare $180,000 tucked under their mattress? That's how much the Fender Duo-Sonic Jimi played on tour with the Isley Brothers is expected to fetch. The blond Duo-Sonic is a 1959 or 1960 model, which the 21-year-old Hendrix paid $160 for before joining the Isley's as a session man on their tour of 1964. 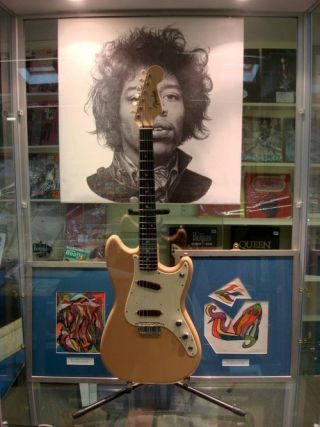 Of course, as a solo artist, Jimi was known primarily as a Strat man, which explains why this Fender went into storage before reappearing in Hendrix manager Chas Chandler's studio. Chandler sold the guitar in 1982 for £400 to music agent and manager Rod Weinberg. The Duo-Sonic goes under the hammer at Cameo Auctioneers Records' Music & Memorabilia Auction on November 2. Check out these shots, including some original artwork by Jimi, courtesy of Small World News Service.